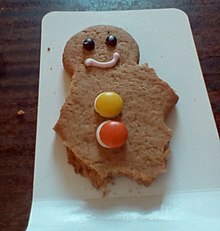 For other uses, see Gingerbread Man (disambiguation). A half consumed gingerbread man. According to the Guinness Book of Records, the world’s largest gingerbread man was made by the staff of the IKEA Furuset store in Oslo, Norway, on 9 November 2009. The gingerbread man weighed 1435.2 pounds (651 kg). Gingy is a talking gingerbread man character in the Shrek series of animated movies. 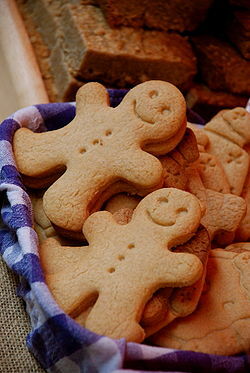 He is derived from the fairy tale "The Gingerbread Man". The Jasper Fford comic detective novel The Fourth Bear features a more-than-human-sized gingerbread man who is a psychopathic serial killer that likes to pull off his victims' limbs. The difficulties in catching him are a reference to the fairy tale. In Pyotr Ilyich Tchaikovsky's famous ballet The Nutcracker (1892), the eponymous hero leads an army of gingerbread men against the Mouse King and his fellows. The Gingerbread People are the main characters in the game Candy Land (1945). The Gingerbread Men were featured in The Muppet Show. In the "Don Knotts" episode, the Gingerbread Men sing the song "Sweet Gingerbread Man" as the opening number. The lead Gingerbread Man is a hand-rod Muppet performed by Frank Oz while the full-bodied Gingerbread Men were performed by Jim Henson, Dave Goelz, Richard Hunt, and Jerry Nelson. In the film The Brothers Grimm, a nightmarish twist on the Gingerbread Man appears. A young child is splashed with mud and the mud steals the child's eyes, nose and mouth. It then forms a small mud body with the child's stolen features for a face. The creature grabs the child and absorbs her into itself. It runs off yelling, "You can't catch me; I'm the Gingerbread Man!" ^ "A History of Gingerbread Men". Ferguson Plarre Bakehouses. Archived from the original on 7 August 2013. Retrieved 4 January 2014. ^ "Largest gingerbread man". Guinness Book of Records website. Retrieved 24 December 2014. ^ Sands, Ali (24 December 2013). "Gingerbread House Takeover". Tailgate Fan. Retrieved 24 December 2014.